The largest collection of American pool tables in Europe, many exclusive to us. Lowest prices, backed up by award winning service, with free delivery on everything. Finance available. At Home Leisure Direct we offer the largest selection of American pool tables in the country, with a great range on display in our Bristol showrooms where you can try them for yourself. Our award-winning team are fully versed in all aspects of pool table knowledge and will be able to help you to choose an American pool table. Our service is second to none, and our sales team can advise you as much or as little as you need on your purchase. All of our American pool tables are bespoke and built to exact specifications, and are of the highest professional quality. We can provide you with a range and choice that will provide you with the perfect table for your needs, whether you're looking for a traditional table or something with a more modern style. The majority of our American tables can come in either a free play version (no coins needed), or with a coin mechanism. American pool differs from English 8-ball pool by having larger pockets (and larger balls), making for a faster and more exciting game than the more thoughtful English pool. American pool tables are generally larger in size, although our range covers tables from 6ft all the way up to 9ft. The standard American size is a 7ft pool table, and in commercial environments and pubs, 7ft tables are by far the most common when American pool is chosen over English pool. We exclusively supply slate bed pool tables, regardless of whether the table will be used in a home or commercial environment. Tables manufactured with a wood bed simply don’t compare to the superior construction of a slate bed. We pride ourselves on the quality of our tables and will never supply anything below our extremely high standards. For those of you looking to get a secondary use out of your pool table as a dining area or work surface, a pool dining table is the perfect marriage of fun and convenience. The majority of our pool dining tables simply require the placing of two hard tops onto the frame; the table is ready for use immediately, and is almost indistinguishable from a regular dining table. To play pool again all you need to do is remove the tops. We have many years of experience in the business of selling pool tables, in which time we’ve had a lot of questions and feedback from customers on the features of a pool table. As a result of this feedback we’ve created the Signature range of tables, aiming to meet all the criteria our customers have when choosing a great table, to create a range of pool tables that are simply the best on the market. The Signature range includes pool tables which have been designed by our own in-house team to include features which have been regularly requested, and feature the finest build quality and aesthetics to ensure that they’ll be a great addition to any games room. The entire Signature range has been designed and hand-built by craftsmen in the UK, ensuring you benefit from the highest quality product as well as supporting our own economy. The materials and workmanship are unparalleled and can only come from the years of experience. We understand that with busy schedules, family life and work commitments, not everyone can visit our showrooms. Buying a pool table is generally something you will only do once in your life, so it's important to make the right choice. We at Home Leisure Direct understand this completely. If you are unsure about cloth colours or wood finishes we can send you samples out - free of charge - to help you make that decision without stress. If you are concerned about your space, the size of the table or whether or not a table will fit in your space, then you can either download any of our “Will It Fit?” guides or call the team who will happily help you over the phone. We will never tell you an item will fit just to get a sale. You can trust us to offer you honest advice, all of the time, so that there are no unwanted surprises on delivery day. We believe visiting us will be the most fun showroom visit you will ever have. Whether you’re looking for an English pool table, a pool dining table or one of our other fantastic games room products, we look forward to welcoming you soon with a freshly brewed cup of coffee and a truly enjoyable experience. Take our Showroom Tour to see what awaits you. Buying a pool table can be a real investment, so let us make that easier for you. We offer Buy Now Pay Later and low interest payments (19.9% APR) on most of our pool tables, with no deposit to pay upfront and flexible payment terms (subject to acceptance). Please see our terms and conditions for more details. We work hard to make sure your pool table purchase is as stress-free as possible from start to finish, and having our own delivery service takes away a major headache that might occur with other retailers. Our new pool tables are transported straight to you by our expert delivery team. Pool Table Buying Advice - over 20 articles and videos, covering everything from the accessories that come with the tables, and which additional items you may need, to playing snooker on your pool table. 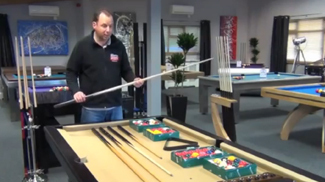 How to Play Pool - our expert professional players Gareth Potts (four time World 8 Ball Pool Champion) and Karl Boyes (four time Mosconi Cup Winner) explain how to play pool, from the basics right up to handling the most difficult shots and match tactics. The differences between American and English Pool - we explain every difference between the two types of pool table. There are quite a few, so this can be really helpful when deciding which type will be best for you. What sizes of pool table are used in leagues? - many customers want to ensure they buy the right size pool table to match what they will have played on in pubs or pool halls. In this video we explain the different sizes used in most common competitions. How to measure your space to fit a pool table - one of the questions we are most often asked is "will the pool table fit into the room? "; in this video we explain how to measure everything properly and make sure you have enough room to cue. Games Room Designer - this powerful browser-based app is free for you to use to design your floor plan and where to situate all the items in your games room - in fact in any room of your house. It's a breeze to use, and you can save your work, print it out and share it with others by email.